We have chosen the high road and refused to engage in public assault on people we once served closely with who just can’t seem to ‘let it go,’ even after all these years. The Elders are privy to many grace-filled private attempts to reconcile, extended in hopes that these unhappy Christians would find peace. Subsequent to the most vocal departures, the Elders of Harvest Bible Chapel designed a system of Elder government filled with meaningful accountability for staff and active involvement of volunteer Elders that exceeds in every way the former system filled with conflicts of interest and poor decision making. Let’s remember — we have a godly, talented, dedicated staff with average tenure among top 10 leaders of more than 24 years, and a congregation focused on moving forward in the next 30 years to claim more ground for Christ. We praise God for the many faithful believers who refused to be interviewed for such an obviously biased effort and covet their prayers for our continued growth in grace and effectiveness. We will continue to ‘owe no man anything except to love’ (Romans 13:8) and direct inquiries to Elder Updates on our website from the respective time periods, mostly 2012 and 2013. Keep the concept of the carefully expressed viewpoint of a plurality of local elders in mind as you go. That will not be unfamiliar to people who at some point were part of what was formerly known as Mars Hill Church between 1996 and 2014. Having mentioned that concept as one to bear in mind, let’s move to the more literal news peg in the news cycle for what seems to be transpiring. If the category of “once-credible Christian publications” is a reference to WORLD magazine that implicitly seems to mean that WORLD was a credible Christian publication at the time of publishing “Unreal sales for Driscoll’s Real Marriage” in 2014. Warren Cole Smith’s article from March 5, 2014 presented how Mars Hill arranged with Result Source to secure a number one position for Real Marriage on the New York Times bestseller list. The article should be accessible in the link below. The “defendant” mentioned in the HBC statement appears to refer to the author of an article that was published at WORLD recently. There is also a statement with responses to two media questions. It is possible that there’s nothing that has been reported in the WORLD article that would be news to people attentively following events and persons associated with Harvest Bible Chapel. The article is available in the link below and is fairly long. MacDonald was vague in the 2017 email about the reason he was ending Harvest’s governance of HBF, but noted his attempt to “regionalize” the fellowship had placed him “under the weight of intolerable oppression.” But according to a leaked copy of a letter by David Wisen, a pastor at a former HBF church who participated in a July 2017 audit of HBF finances, the split occurred because HBF pastors believed Harvest had inappropriately used fellowship funds for its own purposes. (HBF was partly funded by member churches.) Wisen claimed Harvest owed HBF at least $1.8 million. Bob Langdon, the former financial director of HBF who also participated in the audit, confirmed Wisen’s account. He said some of the items HBF paid for appeared to benefit Harvest Bible Chapel much more than the fellowship. For example, Langdon said HBF paid $500,000 for a church management systems upgrade that included new hardware for Harvest’s main campus in Elgin. The audit resulted in an impasse between the two groups. According to Wisen, Harvest offered to pay the new entity of former HBF churches $2.5 million, but only if the group agreed to a “hush clause”—an agreement never to criticize Harvest publicly. Wisen, who was acting as the churches’ representative, said he rejected the offer. Most of the former HBF churches then formed an independent organization called the Great Commission Collective (GCC). Now for those within the HBC orbit it may really be the case that there’s nothing in the Roys article people in that scene didn’t already know. For those in the Puget Sound area the report of a 50k donation to Mark Driscoll to help in the launch of The Trinity Church is news, however belated. This is not a literary effort to untangle what is going on in connection to Harvest Bible Chapel. Rather, we’re reviewing the significance of James MacDonald’s role in the history of Mars Hill. The first thing that seems worthy of mention was that MacDonald was mentioned in a circa 2012 online statement from Mars Hill with respect to governance. In the event that a formal charge and/or accusation is made against Pastor Mark that, if investigated and found to be true, would disqualify him from his position as an elder in Mars Hill Church, a group of five men consisting of both elders within Mars Hill Church and Christian leaders outside of Mars Hill Church, will investigate the charge or accusation and determine if it is true. This group currently consists of Jamie Munson, Dave Bruskas, James MacDonald, Darrin Patrick, and Larry Osborne. If the charge or accusation is found to be true, this group can rebuke Pastor Mark or, if warranted, remove him as an elder at Mars Hill Church. [emphases added] If Pastor Mark is removed as an elder, he automatically ceases to serve on the Board of Elders, on the Executive Elder Team, and as president of Mars Hill Church. In the event that a formal charge or accusation was made against Mark Driscoll that, if investigated and found to be true … a group of five men consisting of both elders within Mars Hill Church and Christian leaders outside of Mars Hill Church would investigate the charge or accusation and determine if it was true. There’s a circularity in the language that raises a question of what would have to be construed as true enough to be investigated and then, upon investigation, be considered true, but at the moment there is no Mars Hill Church so it may be moot. What is not so moot is that in the last year of its existence Mars Hill Church was removed from membership in Acts 29.
for those who don’t recall, in the wake of Mark Driscoll crashing the Strange Fire conference to distribute copies of his then new book A Call to Resurgence, Driscoll ended up publishing a statement saying perhaps MacArthur would be open to meeting in person and inviting a meeting. as we discussed at some length, there were some reasons to have some skepticism about the good faith in which the offer was extended given the accounts that said that Driscoll didn’t have much interest in meeting with people in Macarthur’s circle earlier. But with respect to the intersection of Mars Hill Church and Harvest Bible Chapel the most significant observation to be made was that MacDonald was with Driscoll when Driscoll crashed the Strange Fire conference. If there was room to be uncertain if James MacDonald was on the Mars Hill Board of Advisors and Accountability in October 2013 there was no room for doubt when Paul Tripp joined the BoAA in November 2013. · Counsel—The Board assists and advises the Church on those matters where prudence requires and outside perspective. · Accountability—It provides support and outside objective oversight when needed. · Governance—The Board manages or directs the civil and business affairs of Mars Hill Church, as required of all 501(c)3 organizations. In recent years, the Board of Advisors and Accountability has been an incredible source of wise counsel for which we are very grateful. We are so excited to announce that we have now added our friend Tripp who has accepted our invitation to join our Board of Advisors and Accountability! He is a great brother and partner in ministry. He preached at Mars Hill last the summer for our Best Sermon Ever series and brought the Word with power. Dr. Tripp has been teaching at Mars Hill for many years in various capacities, and we also greatly appreciate his writing ministry especially, Dangerous Calling. So MacDonald was, by November 2013, regarded as a then-current board member on the Mars Hill BoAA. Joining Mark Driscoll on what was arguably a publicity stunt to promote A Call to Resurgence might not seem to fit within the categories of activity members of the BoAA would, nominally, have been expected to participate in. MacDonald was still on the BoAA when it issued a statement in response to the previously mentioned WORLD coverage of how Mars Hill used Result Source. Whatever investigations had been conducted by the BOAA regarding Mark Driscoll between apparently 2012 and mid-2014, those investigations would have involved some kind of participation and assessment on the part of James MacDonald. That is, until August 2014. Dr. Paul Tripp joined our Board of Advisors and Accountability in November 2013 and has been an immense help to our leaders over the past year. Dr. Tripp has extensive experience in discipleship and biblical counseling. Earlier this month, we made the decision together to open the opportunity for him to work with greater focus on issues directly related to his expertise, namely the continued development of our community and redemption ministries. 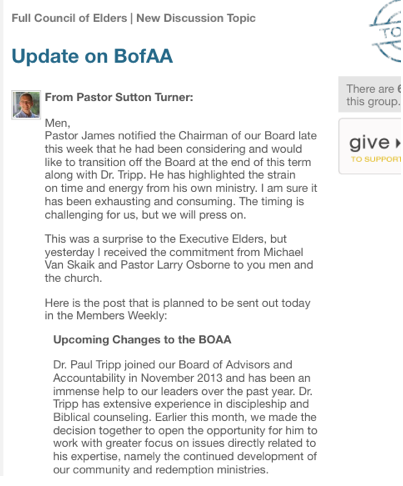 Because simultaneously being a board member and a consultant does not allow for the required definition of independence, Dr. Tripp graciously submitted his resignation from the BOAA in early June so that he can more extensively serve our church as a consultant. We are excited to continue this work with him, and are thankful for his continued support of Mars Hill Church. Considering these transitions, Pastor Mark shared, “I am thankful for the service of both Paul and James, two men I admire and respect. Their service on our board has been a blessing to me and Mars Hill Church in countless ways. The amount of hours they have given as volunteers is extraordinary, especially in light of their other ministry demands.” Candidates are currently being interviewed to replace these open board positions. They will be submitted before the Full Council of Elders for their approval as soon as possible. Let’s go back and consider the earlier quoted WORLD article. Note what MacDonald said he was hoping to focus on by way of no longer participating on the Mars Hill BOAA, Harvest Bible Fellowship. 2017 was more or less three years after MacDonald resigned from the BOAA of Mars Hill. What was the “current direction” of the board of Mars Hill Church at the time of August-ish 2014? There was a lot going on. By the end of August 2014 Mark Driscoll announced he was stepping down, pending an investigation. Driscoll said he will not do any outside speaking for the foreseeable future and postpone the publication of his next book. “I have begun meeting with a professional team of mature Christians who provide wise counsel to help further my personal development and maturity before God and men,” Driscoll told the congregation. Mark DeMoss, an Atlanta public relations consultant and former adviser to Mitt Romney’s presidential campaign, has been brought in to work with the congregation. DeMoss, who represented the late Jerry Falwell Sr. and now Franklin Graham, said he attended the services in Seattle today on his own expense as Driscoll’s friend. That Mars Hill leadership was willing to avail themselves of help from a public relations firm rankled some former members. A guest on the Morning Invasion podcast said as much in a podcast interview you can listen to over here. Whatever that current direction for the BOAA was in 2014 it has become apparent it was not going to be a lasting strategy by dint of the late 2014 decision to dissolve Mars Hill Church. The Tripp resignation was more noteworthy at the time because there seemed to be a tension between the official Mars Hill account of why Tripp resigned from the BOAA and Tripp’s own explanation for why he resigned. MacDonald stated he regarded Driscoll as having been exemplary in willingness to live under the BOAA. But to go by the statement made by the BOAA in response to WORLD magazine coverage written by Warren Cole Smith about Mars Hill using Result Source, the BOAA as a whole agreed that Driscoll and the executive elders hadn’t erred in letting Result Source be used. There was nothing illegal or immoral about the use of Result Source but it was, however, unwise. By November 2013 Mark Driscoll was in the middle of a plagiarism controversy that was perhaps losing some momentum by March 2014 but the revelation that Mars Hill contracted a firm to secure a #1 spot for a book that was itself a significant part of the plagiarism controversy as chronicled by Warren Throckmorton (and here it seems pertinent to mention that Wenatchee The Hatchet raised the issue of the extent to which Mark and Grace Driscoll did not acknowledge the work and influence of Dan Allender in the first print edition of Real Marriage back in July 2013). MacDonald was confident the BOAA could do its job and that’s why he was confident that it could move forward without him. We’ll get to Tripp’s statement that seems to reflect a different conviction about the MH BOAA but first we need to consult Warren Throckmorton’s coverage of Mars Hill updates in August 2014. Pastor James notified the Chairman of our Board late this week that he had been considering and would like to transition off the Board at the end of this term along with Dr. Tripp. He has highlighted the strain on time and energy from his own ministry. I am sure it has been exhausting and consuming. The timing is challenging for us, but we will press on. This was a surprise to the Executive Elders, but yesterday I received the commitment from Michael Van Skaik and Pastor Larry Osborne to you men and the church. The resignation(s) are presented as surprising. It seems that prior to the unexpected resignation of Mark Driscoll from Mars Hill there was a surprising resignation by James MacDonald from the Mars Hill Board of Advisors and Accountability. Now, having established a bit about the nature of the BOAA and that MacDonald was on it, and that he was named as far back as part of a group that would, when occasion required, investigate charges made against Mark Driscoll, we can turn to Dr. Paul Tripp’s statement as to why he resigned from the Mars Hill Board of Advisors and Accountability in the summer of 2014. With respect to Dr. Tripp’s assessment, it may be possible that the Board of Advisors and Accountability may have done exactly what it was designed to do. James MacDonald expressed confidence that the BoAA was going to be able to do what it was designed to do just fine without him being on it. So it looks as though James MacDonald and Paul Tripp came to diametrically opposed conclusions about the effectiveness of the Mars Hill Board of Advisors and Accountability. At the risk of revisiting the resignation of Mark Driscoll in October 2014 all over again, there have been six discreet accounts of how and why Mark Driscoll decided to resign. In an early account, in Driscoll’s resignation letter, he mentioned seeking wise counsel and deciding to resign. In Robert Morris’ account, he advised Mark take some time off to `heal up’. In the 2015 period at contexts like Thrive or in an interview Driscoll mentioned not being able to say good bye. In a diachronic survey of the different accounts of the resignation it began to seem that by Driscoll’s account there was a board who advised he enter a restoration plan and Driscoll said he agreed to it and then he heard a voice say “a trap has been set”. Between Grace and Mark Driscoll there were claims that words of some kind were received of “we’re released” and “a trap has been set”. For those not already familiar with the six accounts and their contents you can go over here. What is worth quoting from the time is the following notice regarding Driscoll’s resignation from the then members of the Mars Hill Board of Overseers, which was a constituent element (with the Executive Elders) of the Mars Hill Board of Advisors and Accountability. On Tuesday, October 14, Pastor Mark Driscoll submitted his resignation as an elder and lead pastor of Mars Hill Church. The Board of Overseers has accepted that resignation[emphasis added] and is moving forward with planning for pastoral transition, recognizing the challenge of such a task in a church that has only known one pastor since its founding. We ask for prayer for the journey ahead. astonishingly, perhaps, the audio for this still works! For now ... . So if you want to hear the audio yourself download this pronto. Mars Hill announced its dissolution in the final months of 2014. The process of dissolution, selling or giving assets and formal closure took place over 2015. At a woodenly literal level of the two men who resigned from the Mars Hill Board of Advisors and Accountability Paul Tripp seems to have been right to state that the BoAA could not do what it was designed to do if what it was designed to do was provide a meaningful form of accountability to Mark Driscoll regarding what he taught, how he behaved as a leader, and what he was able to do in relationship to any potential restorative discipline of the sort that Mars Hill had some reputation for in the 2007-2012 period. But if James MacDonald’s assessment was to be believed, he was so confident that the Mars Hill Board of Advisors and Accountability would be able to do what it was supposed to do he was confident it could do so without his being involved in the board. During the period in which Mark Driscoll stepped down pending an investigation, August 2014 through to the day when Mark Driscoll announced his resignation, James MacDonald had stopped being on the BOAA. The coverage in WORLD has indicated that MacDonald and/or HBC made a $50,000 donation to help the launch of The Trinity Church, Mark Driscoll’s post-Mars Hill church plant. James MacDonald has written an endorsement at the front of Spirit-Filled Jesus, Mark Driscoll’s newest book, and the book also has an endorsement from Larry Osborne. Osborne was part of the group of men that stated in a letter on behalf of the Board of Overseers that they were surprised by Mark Driscoll’s resignation. If a man part of a board of Christian leaders is surprised by the resignation of a pastor who spent years advising people to submit to spiritual authority, does that man just turn around in 2018 and endorse a book by the preacher whose resignation came as a surprise? That is apparently how things work for Larry Osborne for whatever reason.